I'm positive Hollywood won't soon be calling, but in case you didn't get to see my That's Clever segment on TV last week, you can view it on YouTube - quilled poinsettia video. 1. Marquise (make 7) - make a 7 inch ivory loose coil and glue end; pinch two opposite points to make a marquise shape. 3. Glue gold paper around outer edge of each green marquise. 4. On a non-stick workboard, arrange a circle of marquises of each color and glue in place. Off-center the circle of ivory marquises on the green marquises layer and glue in place. 5. Tight coil (make 7) 3 inch, gold. Round the top of each tight coil by pressing against one side of coil with the ball of a glass head pin. Swab glue inside dome to hold shape. Use gold gel pen to color the top of each dome. Glue coils at center of ivory layer by surrounding one tight coil with a circle of the remaining tight coils. 6. Insert ornament cord through the end of one green marquise and tie a hanging loop. 7. Score and fold an 8 1/2 inch x 5 inch piece of green cardstock to make a 4 1/4 inch x 5 inch card. 8. Cut a 2 1/4 x 2 1/4 inch square of gold cardstock. Turn square on point creating a diamond; center and glue on card. 9. Cut a 2 inch x 5 inch strip of gold foil, tearing short ends. Center and glue across card. 10. 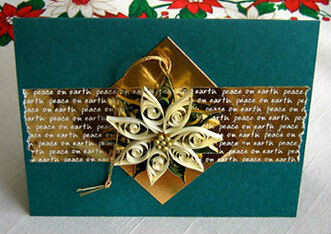 Adhere ornament to center of gold diamond with two short strips of double-stick tape or a dimensional glue dot. This larger version is made the very same way except with longer strips and an extra layer - one layer of 10 inch ivory bracts and 16 inch dark green and ivory layers. The film editing crew pulled off the near impossible and included the making of not one, but both of my Christmas card designs - such a nice surprise. I'll save the how-to for the trio of ornaments card for another time, but a quick disclaimer on that one. If you are familiar with quilling terminology, you'll notice I mentioned alternate side looping in the video, but then demonstrated wheatears to construct the red and green ornament. 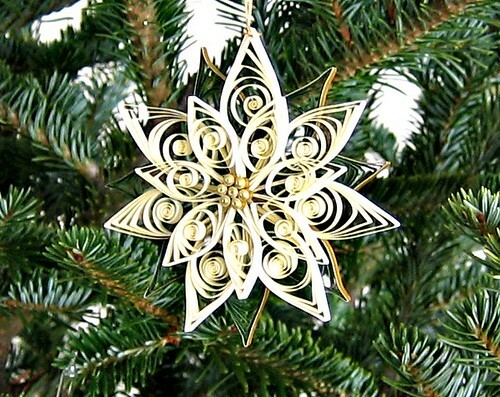 ASL is used to make the other two ornaments on the card, but because of the necessity of editing the segment time-wise, those steps weren't shown. One last fun thing (to me, at least)... if you look closely at the opening snowy location shots, don't believe everything you see! There are no mountains in Delaware. Beautiful work, Ann! Like a true professional, you make it look easy. Fun watching your hands work their magic! I did see your segment and I thought you were great! They didn't make you do anything silly which must have been a relief to you! Your quilling is just beautiful! I recently posted an entry on my blog with a link to this tutorial. thank you so much for putting the video here!! it is so very good to see you doing your beautiful elegant quilling!! You were great and so was the segment. Really enjoyed your video. I follow your blog avidly as I'm a great fan of quilling but just a beginner. Thanks for the inspiration. You have a wonderful quilling skill. Happy holidays to you, Ann! Thank you so much for posting the link. I didn't get your email about the show in time to see it originally. Loved the demo and the beautiful cards. Such a wonderful intro to quilling for those who have never heard or SEEN it done! I am your new biggest fan :) Thanks for sharing. 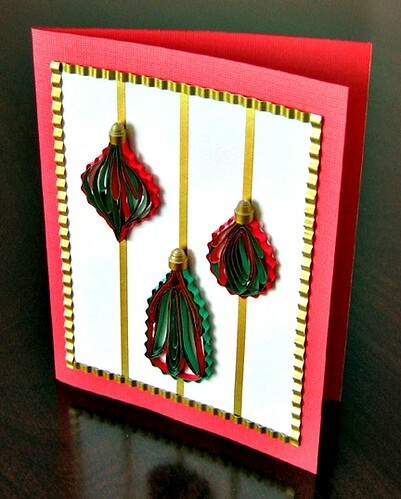 Thank you so much for that video and for the instructions for the poinsettia card. Very interesting. Wow, how interesting to see you and hear you in action! You do make it seem easy. I bet it's not really! Happy Christmas time to you too. Anne,Thanks for stoping by my blog and I must tellyou I truly enjoyed the video from That's Clever that you made. I love to do quilling I thinkit si a lost paper art and you can do such beautiful things with it. I will be subscribing to your blog for sure! Brilliant video! I picked up a number of tips that I never got from the books and articles I've collected on quilling. I hope you do more videos in the future. It makes such a difference to see someone's hands in action. thanks for dropping by my blog. Its great to see experts like you encouraging amateurs like me. thanks for the video. i learnt a new technique!!! Thanks for your input on my quilling, I now realise it takes a great deal of skill, I love your work! Thanks so much for your messages, everyone. I'm glad you enjoyed the video and want to assure anyone who's concerned quilling is hard to do, that it's honestly quite simple. Yes, it takes a bit of practice at first, just like anything. But think about it... the supplies are so basic and inexpensive, even if you ruin 100 paper strips perfecting your rolling technique, you've not lost much more than a sheet of paper. Keep at it - the rewards are great - relaxation and satisfaction! Paula, oh yes, plenty of editing was done. The camera crew was at my house for about 5 hours and we shot the steps for each card separately. The film editors magically made it all come together as well as it did. The experience was actually a lot of fun and I warmed up to the cameras after a while. Yes, I know, Inna, thanks. It was taken down by Vimeo recently, apparently because it was considered advertising for HGTV. At least it had a good run and perhaps helped people to learn to quill. I was amazed that folks continued to click on the link - it received over 11,000 hits!